Thought I better do a blog as I haven’t done one for a couple of days. Wasn’t very well from last Sunday till Tuesday. My throat was really sore and I felt absolutely rotten. Feeling much better now though. The phantom door bell went off (four times ! ! ! ) during the night. I don’t know who it was locking, unlocking then locking their car at 4am in the morning and then again at 5am but I’d like to get my hands on them…..
It’s four weeks since our wheelie bin was stolen and still no replacement from the council. On Friday saw the untimely death of Richard Burns. He was only 34. For those of you who don’t know who Richard was, he was the World Rally Champion in 2001 and the only English man ever to do so. Ironically he died four years to the day he won the championship. He collapsed on the way to the 2003 Rally GB (what used to be called the RAC Rally) and was diagnosed with a brain tumour. He was a lovely man and even in his early days when we used to help lift his Peugeot 205 out of ditches you could see he was a bit special. Sadly being a lovely man and being a bit special doesn’t get you 12 pages in the Sunday newspapers. What does get you 12 pages is being a man who threw his life away. If you haven’t already guessed I’m talking about George Best. Richard never had a second chance of life unlike George and this makes me so angry. Here is a man who was given a liver transplant from a person who sadly died. That person didn’t have to donate their organs but they did. That person allowed Best to continue living when they couldn’t – and what thanks do they get. Not a damn thing. We went to MAKRO (cash & carry) today. They had a special offer buy one get one free on chicken fillets. Everywhere you turned there were these notices saying that due to unprecedented demand they had sold every single chicken fillet in the world and there were none left. For goodness sake, it's only chicken. What's the matter with people. I was out on Saturday morning and when I arrived home Marie was rather excited. "They've arrived" she said. Yes, the Christmas wine order had arrived to replenish the rather depleted wine cellar. Three cases of the stuff. So now, for the first time anywhere, we can reveal the contents of Marie and John's famous wine cellar. Ever since I was stung by a bee when I was five I’ve been petrified of wasps, bees and hornets. Last night I went into the living room and what was buzzing around – a wasp ! ! ! I could have given Linford Christie a run for his money as I bolted for the door. John was in the little boys room so I sat on the stairs waiting anxiously waiting for him to come downstairs. It was a long ten minutes…..
“There’s a wasp in the living room”. We spent fifteen minutes trying to find the wasp but it was no where to be seen. “Honestly, I did see a wasp”. “I believe you but it’s a bit late in the year for them. Are you sure it was a wasp”. “Yes I’m sure. It wasn’t a blue bottle. It was long, thin, stripy and buzzed”. We agreed to give up the search and settled down for a night in front of the telly. Half an hour later, what should appear – Mr Wasp. Baby it’s cold outside ! ! ! We had our very first frost of the winter today. It must have been really cold as we live less than 800 yards from sea so don’t normally get much frost due to the salt in the air. I’m pleased to report that the washing machine is fixed. The repair man came on Tuesday (a day earlier than expected….) and it turned out that a couple of the weights had come loose. Still no replacement wheelie bin. The new neighbours (or should I say their workmen) are getting on my nerves a little. I don’t mind all the banging, that’s to be expected when you get a new house. It’s their loud music. Even teenagers would ask them to turn it down. I decided if you can’t beat them, join them so out came my Runrig CD’s. That got them to turn it down….. Yesterday I got the first two lots of Christmas cakes made. I only have six to do…. Thankfully I’ve learned a few short cuts over the past few years so it takes no time at all (throw everything apart from the fruit into a bowl and mix well. Then add the fruit. Cake done in less than five minutes). I even roped John in to help. While he was mixing the first one, I was preparing the second. Our washing machine isn’t very well. It’s working ok but the noise while it’s spinning is enough to break the sound barrier. It only started doing it yesterday morning. At first I thought I’d over loaded it as I wrote off the very first machine we had by over filling it. However when I did a second smaller load it did the same. As it is still under guarantee I rang Comet to report a fault. Not too impressed as this is the second time I’ve had to report a fault with the machine. The first time was on it’s maiden wash and it refused to spin. When I eventually got to speak to a human being I explained that I wished to report a fault with my washing machine. “Do you want an engineer to come out”. I was really tempted to say “no thank you, I’ll bring it into the store if you like”. However I said yes please. “It’s making an extremely loud noise when it’s spinning”. “Sorry I can’t hear you, could you repeat that for me”. “What kind of noise is it making”. The engineer is coming out on Wednesday. Hello I’m Marie and I have a confession…..
I’ve started watching Buffy the Vampire Slayer. Yes I know I’m several years too late and that as it was probably meant for 12 year olds I’m a little older than there intended audience, but I can’t help it. Do you think I can be cured…..? Update on our missing wheelie bin. Still no sign of a replacement but we’ve found out who’s stolen it. It’s our other next door neighbour. It would seem that their new(ish) bin has gone missing so they have taken ours instead. We’re going to do the neighbourly thing and not steal it back. That’s a very kind gesture I hear you ask. Not really as our old bin smelt of cold pizza so they are most welcome to it ! ! ! ! It's three o'clock on Saturday afternoon. You're painting the dining room walls. There's an area about the size of a tea towel to go. And you RUN OUT OF PAINT !!!! It's true. We put our wheelie bin out the Thursday before last and it's gone. Some miscreant stole it. What was it Paul said about a horse and four piles of bricks. And it gets worse. Marie called the council to see if we could have another one. No problem they said. Take about seven to ten working days. That was twelve working days ago. It would seem that there isn't a spare wheelie bin anywhere in the entire City of Sunderland. At the moment every available piece of land in Sunderland is sprouting houses. Here's a tip. Don't buy one. You won't be getting a bin. That’s what John said when he found out how much replacing the boiler was going to cost. We had hoped it would be simply out with the old and in with the new but oh no. Thanks to new regulations this isn’t allowed any more so we’re effectively having to start from scratch – hence the huge estimate. Time to raid the piggy bank, me thinks ! ! ! ! Haven’t Blogged for a couple of days as there hasn’t really been much to report. On Saturday we went Christmas shopping to the Metro Centre. Decided to get up early (well early for us anyway) and get there for opening time at 10am. What we hadn’t realised was they now open at 9am so got stuck in a rather long queue of cars trying to get into the car park. Great start…. However once inside the place was reasonably quiet so we managed to get all our shopping done by 1pm. Yes I even bought something for my mam ! ! ! ! ! ! Sunday got off to a great start with an phone call from our friends Jan and Andy inviting us to their New Years Eve party. Then it went down hill as my pains started acting up. Today the most exciting thing I did was go to B&Q for a couple of tins of paint. We’re still busy painting the living and dining rooms and have been since September. Can’t you tell we love decorating… Don’t mind other bits of DIY like making things but decorating no. We’ve set ourselves a challenge. The rooms must be finished before 10th December as that’s when we’re putting the Christmas tree up. Sainsburys have put the price of donuts up ! ! ! I went shopping to Sainsburys with my mam this morning and as usual whenever I go there I always come back with donuts. They’ve put the price of the ringed ones up by 4 pence ! ! ! ! I could understand if it were the jam ones as the cost of jam could have gone up. 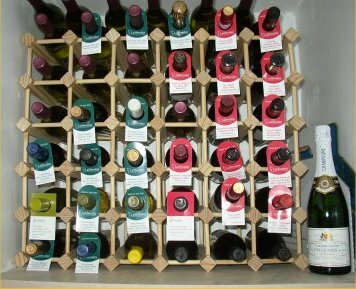 But to increase the price of the holes is a bit unfair…..
Marie – who was very good last night and didn’t have any wine. Can’t say that about tonight though. It’s pizza and wine night. Yippee ! ! ! ! ! ! ! An ordinary day - yesterday. Not a huge amount to report today. Got woken up just after 8 o’clock this morning by the phantom door bell. It was the new neighbours arriving to do more work on their house. Then the phantom door bell went again half an hour later. This time it was Billy the central heating man. We decided on Sunday that the boiler needs replacing as it’s big, ugly, noisy and well past it’s sell-by-date. We await his estimate….. The new neighbours are still having fun demolishing their new home. I’m convinced that they are knocking it down from within as they are making an awful lot of noise. John keeps reminding me that we would have made just as much noise when we renovated our house. True, but he doesn't have to listen to it as he’s at work all day….. So other than a trip to Morrison’s, that’s been my day. Now do I keep to the diet and have a bottle of diet coke tonight, bearing in mind John will be having his usual Thursday night beers or do I say sod it and have a glass of wine. Answers on a post card to……. I had my mam on the phone this afternoon. Nothing unusual about that, other than she was bored. She’s bought some fabric to make curtains for her bedroom but won’t make the first cut in case she makes a mistake. So I’ve got to do the ceremonial first cut on Friday and if they’re wrong then I get the blame and not her…. The conversation then went to ‘do I (meaning me) still want to go to the Metro Centre on Friday’, which really means ‘I’ve (mam) changed my mind. I fancy going somewhere else instead’. The somewhere else is Sainsburys. Not the most exciting of places to visit but at least it’ll keep John happy as I always buy him donuts whenever I’m there. They do the best and cheapest ones around, 12p each ! ! ! Anyway, while we were chatting the subject of Christmas came up. Since my dad died I tread very carefully mentioning the word as it still upsets her. However she’s actually mentioned something she’d like for Christmas ! ! ! ! ! ! ! ! She would like some craft books, preferably on patchworking and quilting. I have a feeling Amazon is going to get a hammering very shortly…..
Christmas shopping ! ! ! We’ve decided on Saturday to go Christmas shopping in the Metro Centre. I know it’s early to start thinking about the dreaded festive season, but I hate shopping at the best of times so thought we may as well get it over and done with before it gets too crowded. Sarah, my niece: something cute or edible from M&S. John’s friend Peter: Anything weird or unusual. Our friends 5 year old daughter Esme: any thing recommended by the shop assistant in Early Learning Centre. My mam on the other hand is the worst person in the world to buy for. Every year I have the same problem and every year it gets harder and harder. What do you get a person who doesn’t want it, has already got it or doesn’t need it. Last year I was going to get her a mobile phone but was told in no uncertain terms that it would be left in the box as she didn’t want one. I thought about getting her a magazine subscription but that went down like a lead balloon ‘they’re all a waste of money’ or ‘they repeat the same item every couple of months’. I even thought about a boring book token but she prefers to get books out of the library ‘once I read a book that’s it, I can’t go back to it again’. So any suggestions would be gratefully received…….